The FLOATING 44 has a modern design and high quality furnishings. It has a spacious living area with integrated, well-equipped kitchenette and direct access to the 15 sqm terrace at the bow, as well as two bedrooms. The bathroom with shower and a toilet with sink are arranged separately. On the roof, a 25 sqm roof terrace offers additional sunbathing and a wide view. A dog up to a maximum shoulder height of 40 cm is welcome. 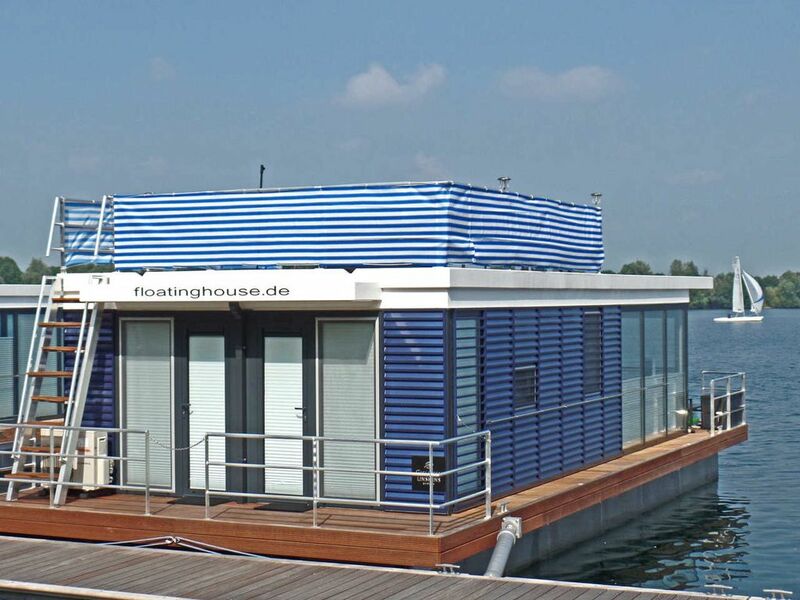 FLOATING 44 are the newest and most crafty variants of the FLOATING HOUSES and since summer 2014 invite you to relaxing holidays on the NORDSEE near Xanten: The FLOATING 44 are fixed houseboats and thus an ideal domicile for all who love the special atmosphere on the water, ... and still want to stay in the country. New since summer 2014: The FLOATING 44 are boats with a solid anchorage and connect the special holiday feeling aboard a boat with aspects of a holiday home. In FLOATING 44 you can spend your vacation very pleasant, because life happens on board on one floor. As part of our rental is not provided that the boats leave the berth. The Lakelands close to the Rhine offers pure relaxation and many recreational activities around the water sports: beach with sandy beach, water rail, boat rental, sailing school, rafting and much more. Due to the central location on the Lower Rhine, the FLOATING 44 have a very good accessibility with many interesting cultural and excursion destinations all around. On the North Sea near Xanten are the FLOATING 44 very idyllic location in a green lakes. North and South are two interconnected lakes, all around you can find the lakes very diverse leisure activities for all tastes. The FLOATING lying on a jetty in front of the plant small town Vynen. Simultaneously, the central location in the Lower Rhine offers all round a very good accessibility with many interesting cultural and excursion destinations. The Lakelands close to the Rhine offers pure relaxation and many recreational activities around the water sports: beach with sandy beach, water rail, boat rental, sailing school, rafting and much more. All information is available at the leisure center-Xanten. Located on a peninsula between South and North can be found in the small town Wardt the Adventure Park, a beautifully located and very interesting high rope course.